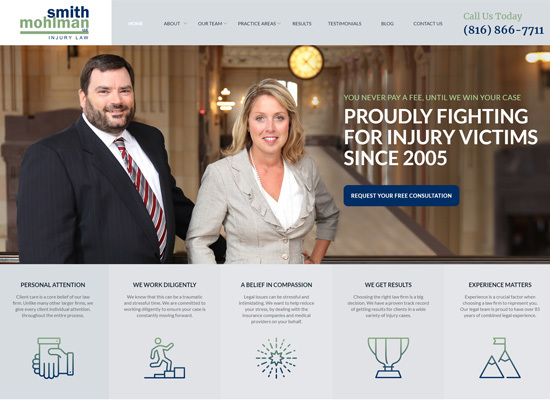 Michael J. Mohlman - Smith & Mohlman ABOUT MICHAEL J MOHLMANMike represents individuals who have been injured through no fault of their own. Mike was born and raised in the Kansas City area and graduated from Bishop Miege High School in 1988. He then moved to Cambridge, Massachusetts to attend college at Harvard University. At Harvard, Mike made the Dean’s List and was the starting left guard for the football team. After graduating from Harvard in 1992, Mike worked for three years before returning to law school at the University of Kansas. Mike represents individuals who have been injured through no fault of their own. Mike was born and raised in the Kansas City area and graduated from Bishop Miege High School in 1988. He then moved to Cambridge, Massachusetts to attend college at Harvard University. At Harvard, Mike made the Dean’s List and was the starting left guard for the football team. After graduating from Harvard in 1992, Mike worked for three years before returning to law school at the University of Kansas. At Harvard, Mike made the Dean’s List and was the starting left guard for the football team. After graduating from Harvard in 1992, Mike worked for three years before returning to law school at the University of Kansas. Mike graduated from KU Law in 1998 as one of the top five students in his class. It was at KU that Mike met his current law partner Rachel Smith. Primary law is car wrecks, tractor-trailer crashes, medical malpractice and nursing home neglect. After law school, Mike worked for some of the largest firms in Kansas City, where he spent several years defending cases involving car wrecks, tractor-trailer crashes, medical malpractice, and nursing home neglect. He was also very involved in insurance coverage litigation to determine the scope of an insurance company’s obligations under its insurance policies. This experience gave Mike an insight into the tactics insurance companies use to defend, delay and deny serious personal injury cases.